Cast: Sato Koichi, Shida Mira and Kanjita Shiori. This is the second out of 3 stories about the school system changing in Japan. 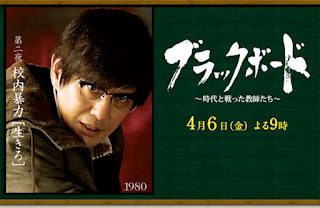 Gota Akira (Sato Koichi) used to be a student of Shirahama’s (Sakurai Sho), and he has a hard time understanding the students hate for school, since he had a hard time being able to go to school at all. Never the less did he become a teacher, but with a different vision than most teachers. He became infamous in his previous school as a “violent teacher” meaning he uses corporal punishment towards delinquent students, which most schools are having a hard time dealing with, mainly ‘school violence’ meaning the school is getting vandalized. On his very first day he meets the root of the problem, Furusawa Yukari (Shida Mira) who was forced into suspension, and has come back, but ruined several classrooms with two of her friends. When the two meet, Gota uses ‘his fist’ on the delinquents, and gets a lot of attention, not only by teachers, but also parents and the media.. I actually like this one more than the other one, even though it’s Sakurai. This one focuses more on the students and the school as a general, and also makes you wonder about different kinds of situations. Okay yes, the delinquent part does make it more my kind of genre, but on the other hand the storyline seems more school-related. The actors are doing a good job, even though it does get lengthy at the end. Somehow they manage to get it swirling in its own bad habits, but yet it has the flavor of excitement.. LOL. It’s good, and worth 2 hours of your time - or mine at least.